For me, the onset of motherhood came suddenly. It was a Friday – Valentine’s Day💗, actually. I sent a letter home to each of my students’ families, letting them know that the long-term sub would be stepping in after Spring Break. I started to visualize nesting, putting a nursery together, baby showers💭. I took pictures of my students as they played holiday-themed party games, and chatted with parents at the Valentine’s Day celebration. I left school that day feeling excited, optimistic, orderly✔️. What I never could have expected was that I wouldn’t be returning. Earlier that week, I had requested a meeting with my school principal to discuss maternity leave. “The High-Risk doctor thinks I should stop working around 30 weeks,” I said nervously😬, “but Spring Break falls around Week 32, so I’ll start my maternity leave then.” Our principal was an approachable, thoughtful, and family-first kind of guy, but my Type A mindset had me stuck in a place of not wanting to be an inconvenience to anyone – even in pregnancy. Wait…really? I was blown away🙃. It was exactly what I needed to hear – I just didn’t know it yet🙄. The placental abruption happened one week later. There were never any sub plans. I am not in control😧. I may keep the ship moving and direct the sails, but someone else is at the helm⚓️. To have a child is to give he or she over to God’s plan for their life, and that sure can be tough🙏🏼. As moms, we do everything in our power to ensure our children know, and feel, our love. We safeguard them to the best of our abilities – physically, mentally, and emotionally💪🏻 – but when it comes to really protecting them, only God can do that. My husband and I were thrust into a parenting world of fragile procedures and dire statistics- one that gave us little choice but to pray, trust, and wait for what was coming next🙏🏼. It was discouraging, disheartening, and, at times, infuriating😔. It was exactly what we needed💕. You see, the problem with control is that it inherently lacks trust. By holding tight to the reins, we can’t leave room for a wiser, more experienced handler🐎. Our experience taught us that relying on Him isn’t always easy, but it is always worth it. This truth presents itself in so many ways – big and small – when it comes to parenting. We trust Him with the physical well-being of our children, day in and day out, and as they get older we pray that He’ll help guide their hearts while they forge a path toward independence🙏🏼. We provide a foundation to the best of our abilities, then we do our best to direct them down the path that He intends ➡️ – in much the same way He guides us, His children. Had my orderly little rug not been ripped right out from under me 3 ½ years ago, I don’t know that I would have ever truly understood the freedom of “letting Go, and letting God.” That’s not to say it isn’t a conscious decision we have to make as parents – over, and over, and over again – especially when the path He’s chosen for our children isn’t the one we would have chosen for them ourselves, when it’s painful, or uncertain😕. When Owen was 3 months old, his brain bleeds required permanent intervention to keep the cerebral spinal fluid flowing🧠. His Neurosurgeon– the head of the entire department at Cincinnati Children’s Hospital – performed a typical VP shunt insertion; but what is usually a 3-4 hour procedure, turned into a 9 hour surgery⏱👀. They tried, over and over again, to insert an additional catheter into our little guy’s 4th ventricle at the base of his cerebellum – the greatest source of his cerebral swelling – but to no avail. Eventually, they called it, and decided the only option would be to try again when he was older. At the time, we were frustrated to hear part of the procedure had been unsuccessful, and disappointed at the prospect of another surgery down the road😔. Fast forward three years, and the Neurosurgery team felt the time was right. We scheduled a shunt revision surgery, and the 4th ventricle catheter was successfully inserted – no issue🙌🏻. Four days later, the doctors were stumped🤔. Owen’s shunt system appeared to be shutting down. He was rushed back into surgery to address shunt malfunction🤕. When the Neurosurgeon emerged hours later, he explained that Owen’s situation was one he had never seen before, and truly couldn’t explain. They were required to rework the entire shunt system in a totally new way, and if it wasn’t successful, we would be looking at months in the hospital while they devised a new plan📆. We went home three days later. Ironically, enough, we did end up back at the hospital🏥. A risk with any major surgery is infection, and Owen developed a pretty significant one: staph🤒. The entire shunt system was removed, replaced, and externalized outside of his body. We spent a month in the hospital while his body was slowly flushed of the toxins😷; the shunt system was reestablished. Looking back, I am overwhelmed by the suffering my baby had to endure😢, but I’m also blown away by God’s timing, and His evident plan🙏🏼. Had the 4th ventricle insertion been successful when Owen was only 3 months old, his little body could have never endured all that it did at age 3. God’s been with us every step of the way🙏🏼. He’s answered our prayers, though not always in the way we might have anticipated. We’ve had to trust, and trust, and then trust some more💙💙. I’ve spent the last three years being my son’s advocate, his cheerleader, and his voice👍🏻. I’ve been convinced that God gave me more than I could handle on more than one occasion – after all, I’m Mom to two boys👨‍❤️‍👨, not just one. But He continues to provide, and He continues to teach me how to let go. This year the boys started preschool. Owen has a 1:1 aide, and a whole host of people on his school team who love my little guy as much as I do. He’s grown in every sense of the word. At our most recent therapy session, I had both boys with me. Owen was beside himself😭, upset at the prospect of hard work that his physical therapist was dangling before him. Meanwhile, his brother had decided that listening to directions was optional that day🤦‍♀️. We were a hot mess🤷‍♀️. I left that morning with a whole host of apologies, and a fresh dose of humility😕. We’re not meant to have all the control, Mamas. We’re just meant to do the best we can in the moment, and then leave the rest up to Him. I’m learning to trust that – which might just be the greatest way I can show my love and faithfulness to a God who loves me, His child, as much as I love mine💞. There’s beauty in embracing everything motherhood has to offer, but I hope you find that the letting go can be pretty magical too. 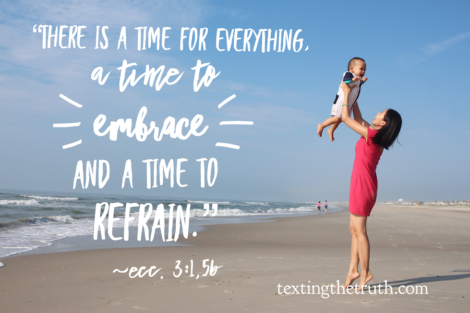 “There is a time for everything, and a season for every activity under heaven: A time to embrace, and a time to refrain” (Ecclesiastes 3:1,5b). “Do not be anxious about anything, but in everything, by prayers and petition, with thanksgiving, present your requests to God. And the peace of God, which transcends all understanding, will guard your hearts and your minds in Christ Jesus” (Philippians 4:6-7). “Ask and it will be given to you, seek and you will find; knock and the door will be opened to you” (Matthew 7: 7). “Surely, as I have planned, so it will be, and as I have purposed, so it will stand” (Isaiah 14:24). “For I know the plans I have for you,” declares the Lord, “plans to prosper you and not harm you, plans to give you hope and a future” (Jeremiah 29:11). Start small. The balance between holding on and letting go can be a very fine line. Try to pick your battles, and take advantage of “teachable moments.” Let your children learn and experience, while also knowing that you’re there to guide them. Try a daily devotional with your kids, or a collection of Bible stories to share at bedtime. Check out some of our favorites in the Treasured Product lists below. I was a teacher and director for several years. I know the energy, courage, time, sacrifice, creativity, and perseverance it takes to teach well.💪 Many of you know it, too. And yet, when it comes to back-to-school, and even throughout the school year, I can get super-focused👀 on praying only for my kids. But yikes, please don’t let me forget to pray for their leaders too!🙏 These are the people who are guiding my kids, not only in their academics, but potentially their future careers, their attitudes, and their character!😲 These are the other adults who will speak into my child’s life over the next year. On Friday mornings, the TtT team meets early to pray.💚 Tomorrow, we’ll dedicate that time to pray for the teachers and leaders in our kids’ schools.🏫 Comment below with the name of your teachers or school, and we’ll be sure to include them in our prayers! Want to pray on your own too? I love this prayer, written by Mary Carver. If you need help finding the words, or if you can’t think straight from all the paperwork you’ve had to fill out this week😉, this is it. Thank you for my daughter’s teacher. Thank you for the time she has spent preparing for this school year. learning how to pronounce all the names and understanding any new guidelines or rules. and granola bars for the kids who don’t have their own. for being a person who truly never stops learning. 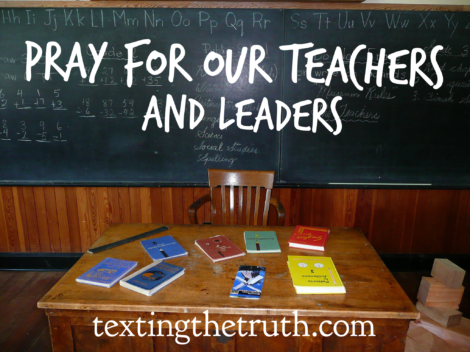 God, I ask that you give my daughter’s teacher rest each night as she prepares for the year. I ask that her rest be refreshing and enough to get her through each day, no matter what it brings. (and maybe a stash of chocolate that lasts longer than she expected). and the wisdom to find solutions and not just band-aids. to help or correct her and to inform me. (And I pray that we’d both receive that well. one that fosters trust and respect, one that leads to knowledge and growth and enrichment. But I also pray that my daughter would not just learn facts and definitions and vocabulary words. values like compassion and creativity, perseverance and kindness. my daughter’s teacher would find something in each of her students to appreciate. I specifically pray that she would see and appreciate my daughter’s unique spirit. God, I know that you have put my daughter together with her teacher for a reason. Please help us show her respect and kindness as we do third grade together, as a team. Help us be a blessing to her, rather than a challenge. And if we are also a challenge at any point, please open our eyes with perspective and truth. Thank you, God, for being sovereign and having plans for our good and your glory.